Fitzroy Island is a large island with rugged terrain and sometimes impenetrable vegetation. 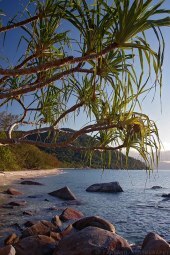 One of the most unspoiled islands on the Great Barrier Reef, the majority of Fitzroy Island is a National Island Park. 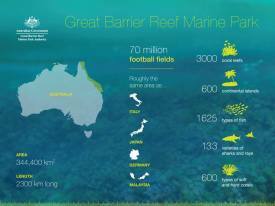 The continental island is 339 hectares in size, with 324 hectares of protected National Park. This includes mangroves, open woodland, tropical pristine rainforest and coral beaches best experienced by the walking trails around the island, birdlife, coral reef and tropical marine life including green sea turtles. Surrounded by fringing reef, Fitzroy is the home to a variety of tropical fish and coral life. 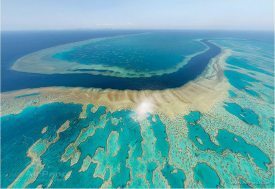 Fringing reef is a type of coral reef located only in the tropics, which is found directly off the shoreline growing in a thin strip. Fitzroy Island and its surrounding reef make up part of the Great Barrier Reef, a protected World Heritage Site, and one of the seven natural wonders of the world. 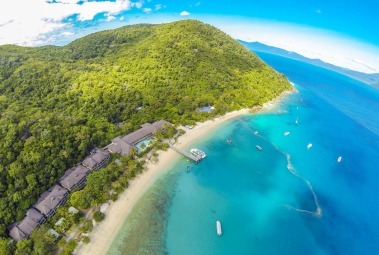 Some of the activities you can participate in while visiting Fitzroy Island include walking and hiking trails, snorkelling, swimming, sea kayaking, ocean trampoline, viewing the reef by glass bottom boat and simply relaxing to take it all in. 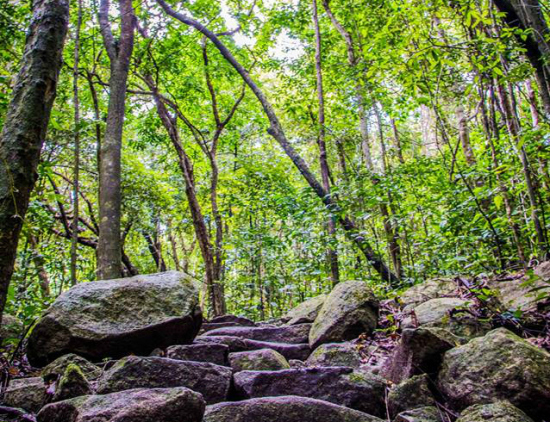 Walking tracks in the national park provide visitors with the opportunity to explore a range of vegetation communities and scenic landscapes. 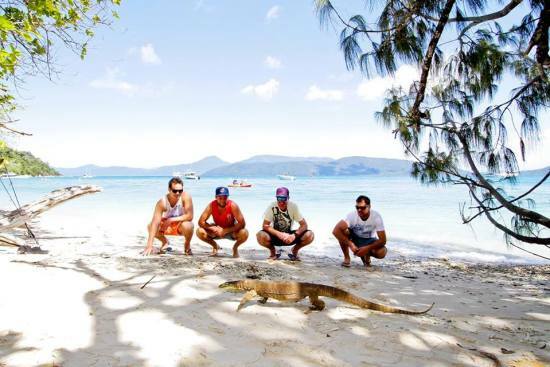 Fitzroy Island National Park is home to a diversity of animal life on the island and in the surrounding waters. The fringing reef just off the beach reveals the diversity of marine life found in the waters surrounding Fitzroy Island National Park. 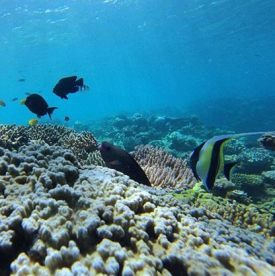 A variety of reef fish, hard and soft corals and other marine animals can be seen. On the Island, you could come across many of the unique species found in this tropical region. Bird life on the Island includes emerald doves, sulphur-crested cockatoos, orange-footed scrub fowls, ospreys, buff-breasted paradise kingfishers and pied imperial-pigeons. The isolation of Fitzroy Island has led to an unusual situation—reptiles have become the predominant predators instead of mammals. 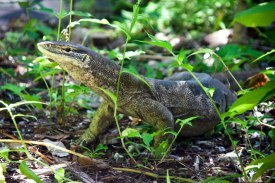 One of the largest predators on the island, the 1.2 m long yellow-spotted monitor, can be seen around the resort area. 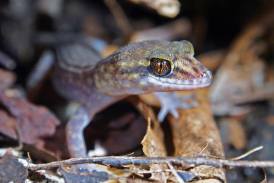 Another reptile commonly seen on the island is the major skink Egernia frerei. This sleek, bronze-brown lizard can grow to 39 cm long. Major skinks feed on insects and plants and can be found among large boulders and logs alongside the walking tracks. Many smaller skinks are also found on Fitzroy Island—look for the closed-litter rainbow skink Carlia longipes, a shiny, light-brown skink with black shoulders and red sides, scurrying among the leaf litter or sunning itself on a rock. Several species of snakes occur on Fitzroy Island, but none are known to be dangerous to humans. You might see a carpet python Morelia spilota, spotted python Antaresia maculosa or slaty-grey snake Stegonotus cucullatus. Two species of tree snake—brown Boiga irregularis and northern Dendrelaphis calligastra—are also common on the island. There are few mammal species on the island—eastern dusky leaf-nosed bat Hipposideros ater aruensis, small swift bats, can be seen at dusk near the lights, chasing insects for food. Small native rodents called melomys Melomys sp. are also active at night. 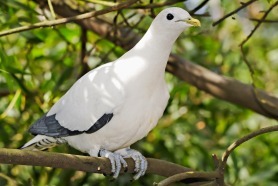 Pied imperial-pigeon Ducula bicolor migrate from New Guinea to nest and feed in the rainforest during the summer fruiting season. Another migrant, the buff-breasted paradise-kingfisher Tanysiptera sylvia, arrives in early November for the summer. 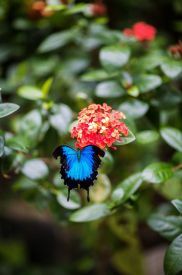 It can be seen feeding on small lizards and snails that it catches by pouncing from a perch in mid-level branches in the rainforest. Fallen fruits and seeds become food for emerald doves Chalcophaps indica. 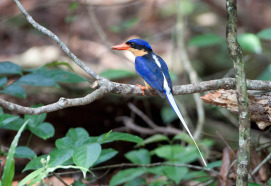 These solitary birds with bright green wings can sometimes be seen fossicking on the forest floor. Flashing white against the green of the forest, sulphur-crested cockatoos Cacatua galerita feedson forest seeds, nuts and fruits. Raucous screeches ring out across the forest as sentinels birds warn the feeding flock of intruders. 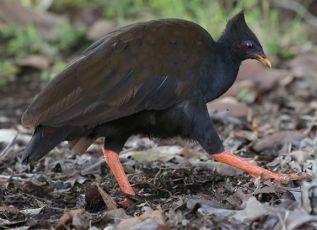 Large mounds of decaying leaf litter and soil found in the forest may be the handiwork of orange-footed scrubfowls Megapodius reinwardt, a brown, ground-dwelling bird the size of a chicken. The mound is built by a breeding pair to provide a warm, safe nest for incubating their eggs. 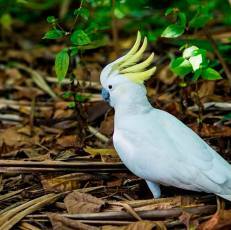 By day scrubfowls may be seen scratching around in the leaf litter on the forest floor for food such as fallen fruits, seeds, insects and snails. Ospreys Pandion haliaetus can be seen soaring effortlessly above the island with their typical flap-flap-flap-glide motion. The glide can suddenly become a swoop as the osprey dives into the water, emerging with a fish gripped in its sharp talons. A variety of plant communities can be found on Fitzroy Island. Heaths and open woodlands of eucalypt, acacia and turpentine trees cover the exposed slopes and spurs on the island. Rainforest grows in the damp valleys and mangroves line the creeks. Coastal plants tolerant of salt spray and low nutrients, such as casuarinas and pandanus palms, fringe the beaches. Fitzroy Island is part of the Great Barrier Reef World Heritage Area. The reef surrounding Fitzroy Island is a "Fringing Reef" which grows close to the coastline. This is a perfect option for beginner snorkellers, children and for those who get seasick. The fringing reef just off the beach reveals the diversity of marine life found in the waters surrounding Fitzroy Island National Park. 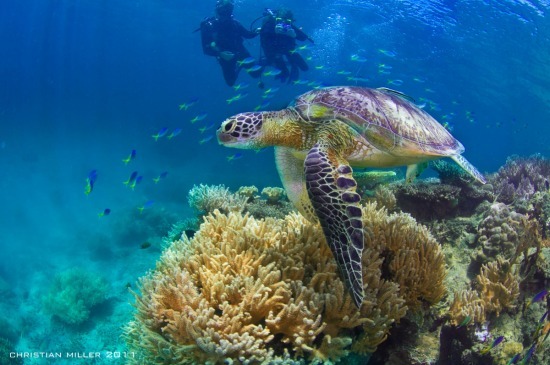 A variety of reef fish, hard and soft corals and other marine animals can be seen. 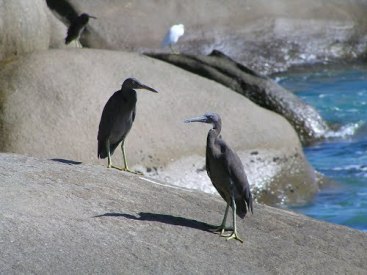 The fringing reef starts at Nudey Beach and runs around the corner near the rocks at the southern end of Welcome Bay. This stretch of reef is extremely close to shore, if you pick the conditions right then walking to Nudey Beach and drifting with the current back to Welcome Bay will provide the best and least strenous snorkel experience. The fringing reef at the northern end of Welcome Bay is a fair distance from the shore. It starts at the quite prominent 'Bird Rock' and runs almost all the way down to the jetty before there is a small gap where the boats come in. The snorkelling at Fitzroy is greatly underrated. 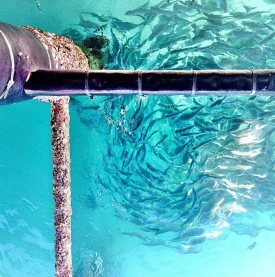 Visibility is variable, pending season and current, usually anywhere between 5m – 15m, but the coral is excellent and the variety of fish superb. The clownfish (Amphiprion percula) can be found, as well as other anemonefish. 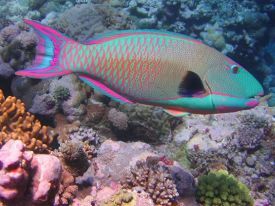 Parrotfish and wrasses are common, and green sea turtles regularly frequent the bay.